The next time you see a banner hung across a street or from a bridge, or hoisted as part of a street march, protest or demonstration, take a closer look. You may see that the banner has holes or slits cut into it. But why would someone cut holes into a perfectly good banner? These are so-called “wind vents”, and for some reason people have been mutilating their banners with these holes in the belief that their presence will significantly reduce the wind loading on the banner. But does a banner with holes or slits really have an easier time in the wind than an equivalent banner that is hole free? It is not known when people started to cut holes into their banners. There is very little written about the practice, and much of the knowledge appears to come via word of mouth or has been transferred from other wind related domains. What is obvious from the websites of the world’s sign and banner makers is that they are frustrated with having to cut holes into their lovingly-made creations. Some banner makers simply refuse, and tell their customers that if they want holes, then they can cut them themselves. The apparent importance of banner wind vents has led some local governments around the world to make them mandatory for banners installed in certain locations. No vent holes, no banner allowed! The regulations of the Brisbane City Council, in Queensland, Australia, state that for banners to be installed on the city’s iconic Story Bridge, they “must be provided with wind vent holes” and that “wind holes (vents) need to be spaced at approx. 3m intervals”. Brisbane City Council’s Story Bridge banner design guide indicating location of ‘wind vent holes’. The small town of Springville, Utah, USA, states in its regulations that at least 20% of the area of the banner must be made up of holes. It suggests “half moon shaped vents 4-6 inches wide and facing down throughout the banner”. To understand what, if anything, wind vents do for our banners, we need to visit the work of aerodynamics specialists. In 1956, B. G. de Bray, an aerodynamics expert at the UK’s Royal Aircraft Establishment, performed a series of wind tunnel tests to show how flat plates with holes in them performed in a moving air stream. He was interested in how plates could be used for airbrakes on aircraft as they land. His experiments showed that perforations (holes) make the air flow more stable but that there was “only a comparatively small reduction in drag coefficient”. He shows a graph recording the relationship between the area of the holes and the change in drag coefficient of a flat plate. The graph indicates that making 20% of a banner’s area holes will reduce the drag by around 5% in a wind of 150km/h. These figures are taken from de Bray’s 1956 work on wind tunnel testing of flat plates with holes and how drag relates to hole area in a 150km/h wind. Note that CD designates the drag coefficient, which is a normalised way of representing force that accounts for plate size (or in our case the banner) and wind speed. Doing this allows the wind tunnel data to be scaled to full-size. When we consider de Bray’s other finding – that holes do make the air flow more stable – we can look at a common example of this in action in round parachutes. Billowing structures that fill with air on the windward side, such as round parachutes, become unstable when there are no holes in the structure. The air tends to spill almost randomly from the structure’s edge. This makes the structure flap around in the wind in a seemingly random manner. This was discovered in the early days of parachute development. In the late 1700s, a number of parachute developers were killed due to accidents relating to their unstable and oscillating chutes. In 1804, Frenchman Joseph Lelandes invented the apex vent, a hole in the top of the parachute. This appeared to solve the problem of stability but did not appear to reduce the drag, ideal for parachuting where you need the drag. Since then there have been many studies showing the benefits of holes in round parachutes. 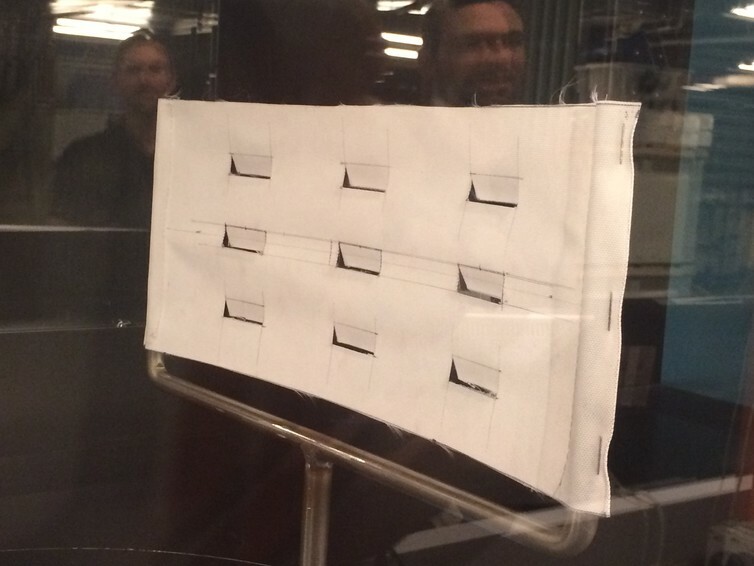 One group even found during their experiments that vent holes in round parachutes slightly increase the drag on the chute while making it more stable. Following in de Bray’s footsteps, we decided to turn to wind tunnel experiments to assess just how much impact those holes had on wind forces. 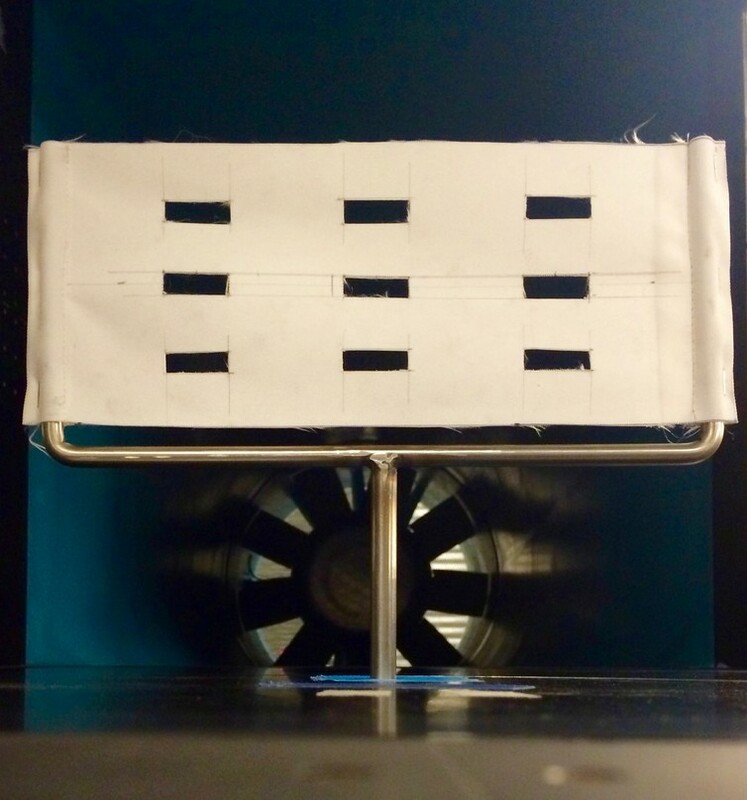 We conducted a series of simple experiments where we put scaled versions of banners in a wind tunnel and measured the wind forces. We did this for a range of wind speeds and number of vents (holes). We then measured how the forces changed from test to test. We performed experiments where vents were rectangular holes cut in the fabric and others where the vents were rectangular holes cut on three sides and allowed to hinge at the top (flaps). A test banner with 7% of its area made of holes in the wind tunnel. As for above, but showing a banner with 7% porosity and hinged flaps. Experimental wind speeds tested ranged from approximately 25km/h to 100km/h and the range of vent hole area to total banner area ratios (porosity) assessed was from zero (no holes in the banner) to approximately 20%, which coincides with the Springville regulations and makes a pretty holy banner. A plot showing drag on the banner versus porosity of the banner for the 100km/h tests over the range of banner porosities. The vertical axis shows the drag coefficient (CD) ratio, which is the wind force measured on the porous banner divided by the wind force on the solid banner. A porosity of 0.1 is 10% holes/vents/flaps. A value of 1 in the figure (above) would indicate that the vents have done nothing and a value of 0.9 would suggest there has been a 10% reduction in load. 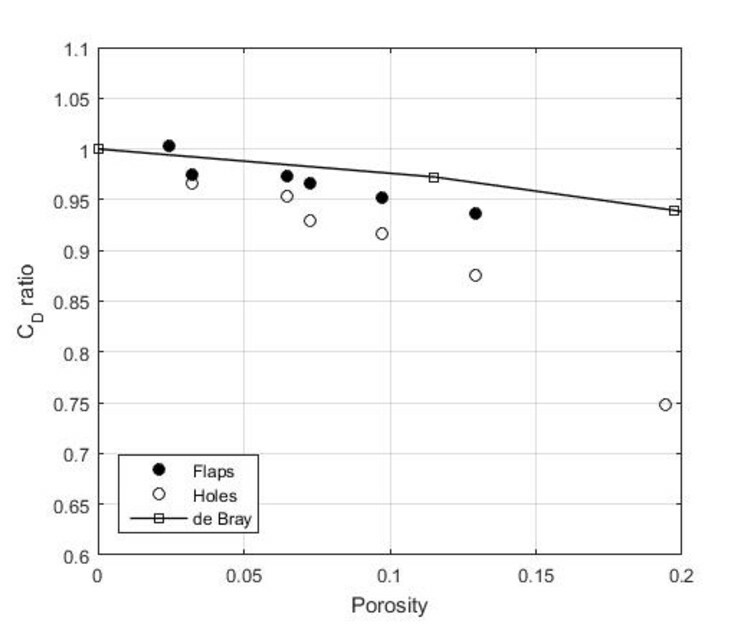 It is clear that wind vents do reduce the wind load on a banner, but as de Bray showed, the reduction in load is relatively small until porosity becomes large. The reduction in drag force is greater for holes and hinged flaps than found by de Bray (and others) for uniformly perforated plates or fabrics. The wind speed makes a difference. At low wind speeds the presence of vents can actually increase the wind load on a banner, which in our test was found to be up to 5%. In general though, force coefficients decreased as wind speeds increase. This was particularly the case for the banners with flaps, where these vents became more open as the wind speed increased. So the type of vent makes a big difference. Banners with holes rather than hinged flaps experienced lower wind loads. Both of these vent types experience lower loads than on uniformly perforated plates, which perform similarly to porous mesh fabrics. With these points in mind, we return to the Brisbane City Council’s regulations for placing banners on the Storey Bridge. It is now possible to calculate the effect of their prescribed wind vents. If we assume that they would like holes, and the maximum size of a banner is 18m wide by 0.9m high, then our best guess estimate is a semi-circular hole radius of 25cm noting also that five wind holes are required. We calculate that at most, 3% of the banner will be holes. Interpolating our figure this would give us a 2% reduction in wind load. A sign of 98% the area of the maximum would be 18m wide and 0.88m high and would only require you to trim 2cm off the bottom of the sign to create a sign of equivalent drag to the one with five holes in it! It hardly seems worth the effort. The science shows us that flat structures behave one way, and billowing air-filled structures behave a different way. It seems that our legislators have been confused and applied results from parachutes to flat banners. If you have a banner tied in such a way that it will remain relatively flat in the wind, then it seems that the benefits of putting in vents are minimal unless you make your banner into Swiss cheese. You are simply better off making a slightly small banner to achieve the same reduction in load.